Vox, a. oft-criticized lefty "explanatory journalism" site, brings good good tidings of great joy for Obamacare's 8 million 6.5 million 2.6 million newly- enrolled exchange consumers. Namely, many of them will face the choice of switching plans or possibly paying significantly more for coverage in 2015. Unless they change their insurance plans next year, many people with insurance subsidies could see their premiums go up more than they expect, according to a new report from Avalere Health...Annual changes to insurance premiums aren't uniform across plans. That means the "benchmark plan" can change from year to year — with financial consequences for those with subsidies. These consequences will be most acutely felt by low-income enrollees. "Two-thirds of people enrolling in silver plans are choosing one of the two lowest cost silver options," said Caroline Pearson, vice president at Avalere. Take Sue, an imaginary Maryland resident who enrolled in her state's benchmark plan for 2014. With her subsidy, she was paying $58 a month for health insurance. But in 2015, her plan is going from the second-cheapest silver option to the ninth-cheapest. 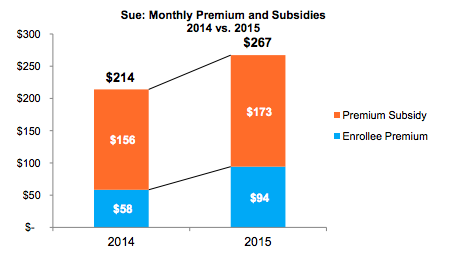 The subsidy, now pegged to a different plan, won't cover as much of Sue's premium as it used to. Her share of the premium will climb to $94, a 62 percent increase. All insurers in the state are hiking their premiums, from 2.7 percent up to 21.6 percent. Michigan’s largest insurers, Blue Care Network and Blue Cross Blue Shield, are hiking premiums by an average of 9.3 percent and 9.7 percent in 2015 for a whopping three-quarters of Michigan residents that purchase their coverage on or off the state’s Obamacare exchange. Blue Cross executive Terry Burke said the hikes are needed to account for ever-rising health care costs and uncertainty related to the Obamacare expansion bringing in sicker-than-average patients. “We’ve got a big influx of people and we don’t know what their claims conditions are,” Burke told the South Bend Tribune. “The actuaries are concerned about that risk mix.” The next largest insurer, Humana, is hiking rates by 18 percent on average for its 16,600 customers. Smaller insurers are upping their premium rates in a wider range, from around 3 percent to as high as 21 percent.